After stomping out of the larder, Blacknail shoved his volatile emotions aside and went to work. The most important thing Saeter had ever taught him had been how to control his rage and how to focus on things you didn’t want to do. There was no one forcing Blacknail to do anything anymore, so he had to do it to himself. Only ruin awaited him if he forgot his master’s lessons and acted out. He had to be patient and cunning, like a spider weaving a web. The clay was still airing out in the sun, so Blacknail headed over to the drying rack. The pelt of the deer he had slain was still stretched out on the rack. It looked ready for the next step of the tanning process, so Blacknail went off to gather some helpers. Gob was busy teaching basic tasks to goblins and disciplining the overseers so he tracked down Elyias and Khita. Both of them could be found sleeping in their respective caves. Humans usually slept-in very late for some reason. “Do I really have to do this? Why can’t you just get a blanket from Geralhd or something?” Elyias asked as he and Khita followed Blacknail over to the drying rack. “Stop being lazy. You’re not doing anything but sitting around,” the hobgoblin told him. “Because you’ve basically kidnapped me and are holding me here in this gods-forsaken place against my will!” Elyias replied angrily. It wasn’t by mistake that Elyias had ended up stuck with Blacknail. 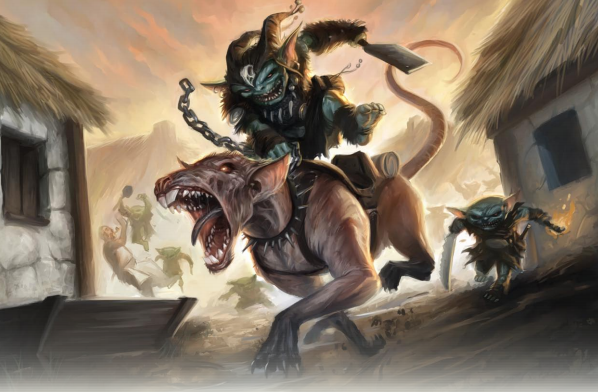 Goblins could do simple tasks like fighting and hunting, but for some things Blacknail needed helpers with a bit more brains in their skulls. He didn’t have time to teach all the goblins by himself, so he planned to teach Elyias and then have Elyias pass the knowledge on. Since Khita had interjected herself into his plans the hobgoblin planned to use her for this as well. “Isn’t there something less boring I could help with?” Khita asked. “No, you wanted to follow me and help, so this is what you will do. Watch and learn,” Blacknail told her. The hobgoblin then proceeded to show them how to finish tanning the stretched out hide. First, he took the skin down and carefully scrapped the hair from it. Next, he took a big rock and bashed the animal's disembodied head until its skull broke open like an egg. The brains were then scooped out, thrown in the bucket, and mixed with water until it became soup-like. The resulting goop was worked into the hide by hand. “This is so disgusting,” Elyias remarked as he cringed back away from the slop in the bucket. “Yet tasty,” Blacknail replied. He enthusiastically licked his fingers to prove the point. “Can I not do this?” Khita asked. The answer was no. Blacknail needed both of them to learn to do this. There was a near endless supply of smaller hides that needed to be preserved, and he wasn’t going to do it. He was the leader after all. The only reason he was working so much right now was to avoid more work later. Hopefully, once he had all his minions trained he could start napping all day while goblins brought him the best morsels of food. Once the hide had been thoroughly massaged with the brain oil by all of them, it was wrapped up and placed in the larder, where it would keep cool and be allowed to soak until tomorrow. It was annoying how making things the human way took so much time. There always seemed to be several steps where you had to just leave the material alone for hours or days. Why couldn’t the humans have created better ways of doing this stuff? Were they just lazy? “Are we done now?” Elyias asked. “Yes. Now we can start making things from clay,” Blacknail replied. “Your loss,” Blacknail answered as licked his fingers clean. Now that the clay Blacknail had procured yesterday was dry it was ready to be processed. Joan had explained the process yesterday, and it hadn’t sounded that hard. The dry clay was already on top of a flat rock so the workers immediately began using smaller stones to break it up and crush it down to powder. Blacknail then gathered up the dust and ran it though the loose cloth he had been given yesterday by Joan. This removed all the small rocks and bits of plants. He had been told it was possible to use your hands and pick out the unwanted debris but that this was easier. He liked easier. “If you want to continue getting free food and a warm place to sleep you will work harder,” Blacknail hissed back. “I used to fight rats that were bigger than me for garbage to eat,” Blacknail told them. He had seen a few human street children before and they really didn’t have it that bad. Goblins usually had it much worse. Elyias grumbled to himself but went back to work without another complaint. Blacknail added water to the clay powder until it became a malleable blob that kept its shape. “Huh, Joan was right. This is pretty fun,” Khita remarked as she took a blob and began to shape it into a bowl. Blacknail and Elyias were both doing the same thing. They soon had a dozen crude bowls ready to be fired. “Now for the fire!” Blacknail said as he admired his creations. “Yes, the fire!” a raspy voice agreed. What? Blacknail glanced over his shoulder to see who had just spoken. He was quickly treated to the sight of a pale goblin with a huge smile plastered on his face. It was Ferrar. “What are you doing here?” Blacknail asked. How did these stupid goblins keep sneaking up on him? “I’m watching,” Ferrar replied as he smiled at Khita and Elyias. Blacknail had already known that, so the goblin’s vague answer annoyed him. “That doesn’t sound like him,” Blacknail remarked. Imp always seemed to be up and about somewhere. The vague words sounded vaguely threatening, but Blacknail decided it had to be unintentional. There was no way the feral goblin knew the language all that well. Blacknail was frankly surprised he could speak at all since he was originally from this territory. Imp must have taught him. Earlier, the hobgoblin had ordered some goblins to dig a pit and gather wood and tinder. Now it was time to finish up this experiment. Blacknail, Khita, and Elyias each grabbed two bowls and placed them in the middle of the pit. Blacknail then carefully arranged a ring of firewood around the clay items. After adding a bit of tinder, he used his flint and steel to set it all ablaze. When the wood was completely ignited and several minutes had passed, Blacknail carefully added more wood. Over the next half hour, he kept building the fire closer and closer to the bowls until the flames touched the items. That was when he placed a large pile of wood right on top of the clay and created one huge bonfire. By this time the waves of heat thrown off of the blaze was causing him to sweat profusely. Now that the fire was burning steadily, Blacknail didn’t feel the need to stick around. Someone needed to watch it, though, and he had other things for Khita and Elyias to do. That left only one option, Ferrar. Normally Blacknail wouldn’t trust a goblin to pay attention that long, but Ferrar seemed to spend most his time around fire. “Keep this going for at least three hours and then let it cool down during the night,” Blacknail told the goblin. “Burn things made in fire!” Ferrar responded excitedly. The goblin then ran over to the pile of firewood and threw another log on bonfire. “Good enough,” Blacknail grunted. He would come back later and make sure everything was alright. After working so hard, they all went to the larder to grab some food. Once they had filled their stomachs, Blacknail had Khita and Elyias start to teach groups of goblins how to tan and preserve animal skins. They didn’t have any more deer pelts but they did have a near endless supply of rabbits from the traps the goblins were putting out. While the others were doing that, Blacknail took another group of goblins and overseers out to gather more clay. They would need quite a lot more of the grey ooze to start mass-producing bowls and other useful items. Everyone worked hard teaching and gathering materials until it got dark. Blacknail then once again threw a huge feast using the food the goblins had brought in and stored in the larder. As the chattering masses of goblins rushed over to eat, Blacknail counted quite a few new faces. More goblins were either coming out of hiding or were wandering out of the forest and joining the tribe. There were now at least sixty goblins living in Blacknail’s outpost. Sixteen of those were trained overseers that would actually obey orders. Weirdly, both Scamp and Imp didn’t show up, but Blacknail didn’t think too much of it. Maybe one of Imp's magic stones had finally exploded and killed them. The next morning, Blacknail woke up early and walked over to the smoldering remains of the bonfire he had put his clay bowls in. Khita and Elyias followed him, and Ferrar invited himself along. When they got there, all that was left was a pit full of black charcoal and white ash. Blacknail reached in and started rummaging through the ash to find the bowls. “You might want to use a stick or something. That could be hot,” Khita remarked as Blacknail yelped and withdrew his hand. “Say it faster next time,” Blacknail hissed sourly as he sucked his sore thumb. Khita was so useless and annoying. It was infuriating. Further digging using a stick unearthed the clay bowls. Five of the nine had survived the firing intact and were now an earthy brown color. Their uneven and crude shapes were none-the-less functional. The other four had split in half or shattered into fragments and were thus completely unusable. “These three are mine! They all worked,” Blacknail proudly congratulated himself as he selected three of the intact bowls at random. He was a master craftsman. “That one has my fingerprint on it,” Khita pointed out. “I meant this one,” Blacknail replied as he quickly switched the bowl with another successful one. No one said anything, but the humans both rolled their eyes. Blacknail didn’t care what they thought. They were just jealous of his obviously superior skill. Since the experiment in making clay had mostly worked, Blacknail got goblins working on producing more. He needed a lot more than five bowls. Groups of goblins were sent out to gather clay, process it, and to dig the firing pits. Elyias was put in charge of the overseers and Ferrar volunteered to help him burn things. That left Blacknail and Khita free to finish up the tanning of the deer hide. They took the hide out of the cool larder, cleaned it a bit, stretched it out between them by hand, and then softened the hide by hitting it with a stick. An odd surge of bittersweet emotions welled up in Blacknail as he worked with Khita. He could clearly remember doing this with Saeter, although the stretching part had been more respectful and less like a game of tug a war, which Blacknail had easily beaten Khita at. Once the hide was soft enough it was ready to be smoked. Blacknail sewed up the tears in the hide and placed it above the fire using a rack made of sticks. He threw green wood on the coals to produce lots of thick smoke. He smoked both sides for an hour each before taking it down from the rack and holding it up proudly. “It’s done! Aren’t I great at hunting and making useful things!” Blacknail bragged. “What are you going to use it for?” Khita asked dryly. She made no comment about the hobgoblin’s own question. “Gob has really done a lot…” Khita started to say before Blacknail cut her off. “Shut up, I’m the leader. I want this. It’s neat,” he told her as he walked off to hang up his new trophy. Who cared what Khita thought? After admiring his work, the hobgoblin helped the goblins processing the clay when they ran into a problem. They only had the one cloth to sort the dust and it was already wearing down. Blacknail consulted with Gob and together they came up with the idea of using the soft fibers under all the bark Gob had collected to weave a mesh of their own. It took a lot of time to make the cloth, but Blacknail didn’t trust the goblins to sort anything properly by hand. They were too lazy and stupid. The clearing full of rocky hills that the goblins used as a base was now constantly humming with activity. Groups of goblins were always walking around and working at different things. There were gatherers and trappers bringing back food and materials. Overseers were watching over the food. Several goblins were putting hides and meat up on the drying rack. Gob and a few helpers were almost done building the longhouse. Other goblins were firing clay or chipping stones to make tools. Blacknail had just lain down to rest for a bit in the sun, when Elyias showed up and started bothering him. “It’s Scamp. He is sick or something!” the man told him. “So what?” Blacknail replied grumpily. The heat from the sunlight was pleasant and he didn’t want to move. The little nuisance had been very quiet lately. With a sigh, Blacknail got up and followed Elyias over to the cave he shared with Scamp. It was smaller and mustier than Blacknail’s. It was little more than a rocky overhang with three walls and a large open entrance, but that probably suited Elyias fine since humans didn’t see well in the dark. Scamp was entangled in a dirty blanket and sleeping against the back wall. “What’s he doing?” Blacknail asked as peered at the goblin. Feeling suddenly uneasy, Blacknail walked to the goblin’s side and looked down. He scowled at what he saw, and then he kicked Scamp in the ribs. There was a solid thud noise but the goblin didn’t react. Blacknail kicked him again. “What are you doing?” Elyias asked. He sounded alarmed by the sudden violence. “He’s not sick. Scamp’s sleeping because he’s turning into a hobgoblin. Look, he’s got tiny little horns,” Blacknail hissed angrily. There was indeed a pair of horn tips growing from the goblin’s head. The entire point of building up the goblin lair and disciplining the local goblins had been to create hobgoblins. However, Scamp wasn’t the type of goblin Blacknail had wanted to transform. He would probably just become even more useless and eat more, a lot more. “Yes, in a day or two,” Blacknail answered before suddenly freezing. He had just had a terrible thought. Imp had been awfully quiet lately. In fact, he had disappeared at the same time as Scamp. Blacknail immediately dashed out of the cave. He had no idea where Imp usually slept so he quickly tracked down Ferrar. The goblin was busy shaping clay to throw in the fire. “Has Imp been sleeping all day?” Blacknail asked Ferrar. The goblin considered the question for several seconds before nodding in the affirmative. Blacknail resisted the urge to choke him to death. “Things change. Goblins change,” Ferrar answered as he squished a clump of wet clay between his fingers. Wait, he was missing the main point. Having a pair of newly changed hobgoblins running around the camp unsupervised was a terrible idea. Having a new hobgoblin running around with a backpack full of magical explosives was worse. Blacknail wasn’t going to let that happen. He needed a plan, one that would allow him to keep the new hobgoblins out of trouble - and most importantly - keep himself in charge. Things were going to become interesting when Scamp and Imp woke up. Thanks. There are a few new scenes, especially in the last chapter. yes finally a hobgoblin shaman!! Imp for Shaman!! Haha never try and compair sob stories with a goblin.